Date: Saturday, November 15, 2014. Where: Bellagio Two, Forbes Town road cor Burgos Circle (function room). Please check the poster for more details.. 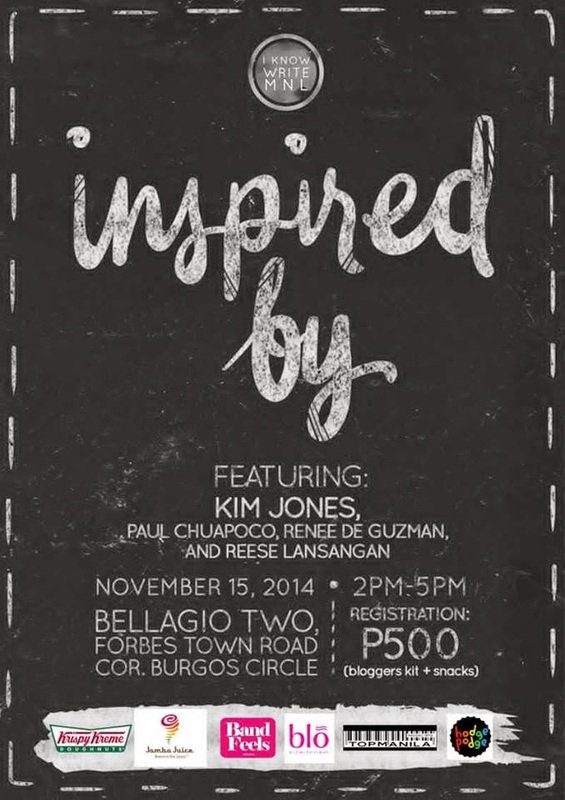 This third workshop titled Inspired by is brought to you by I Know Write MNL made for young bloggers by young bloggers! We hope you can participate in this fun event and hang out with other fellow bloggers while being inspired by our special guests! We will only have 30 slots, (Strictly no walk ins and no refunds) So reserve one for yourself right here, right now! Registration fee is: P500 (registration fee, snacks + bloggers kit) This event is for ages 13-21. If you have paid for your registration fee, please send us the deposit slip via Facebook message. See you!